Sometimes you come across a beer that has such a cool story behind it, you just have to try it. And this beer from Boulevard Brewing Company (Kansas City, Missouri) has one. Boulevard started as a traditional Bavarian brewhouse on Southwest Boulevard in Kansas City. The first beer made, in 1989, was Boulevard Pale Ale, and John McDonald (Boulevard’s founder) delivered the first keg of it to a local restaurant. In 2006, the brewery made major expansions, increasing from a modest 6,000 barrels to the aforementioned 600,000 barrels. Quite a jump! 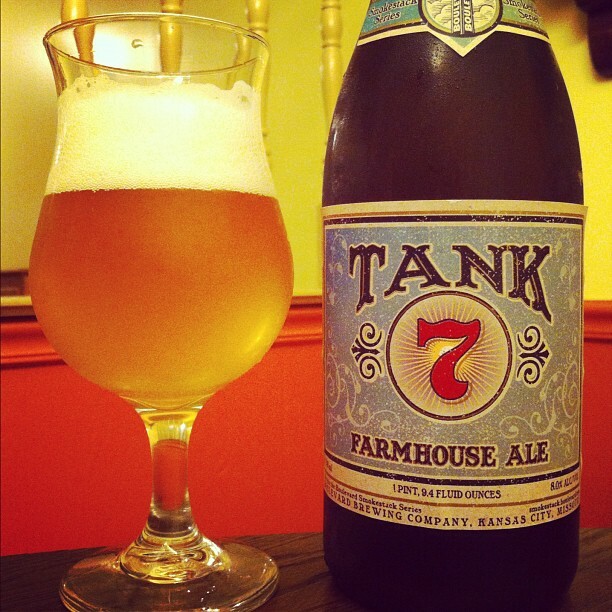 Tank 7 Farmhouse Ale gets its name from Boulevard’s fermenter number seven, which is where the recipe for this traditional Belgian-style Farmhouse Ale came together. 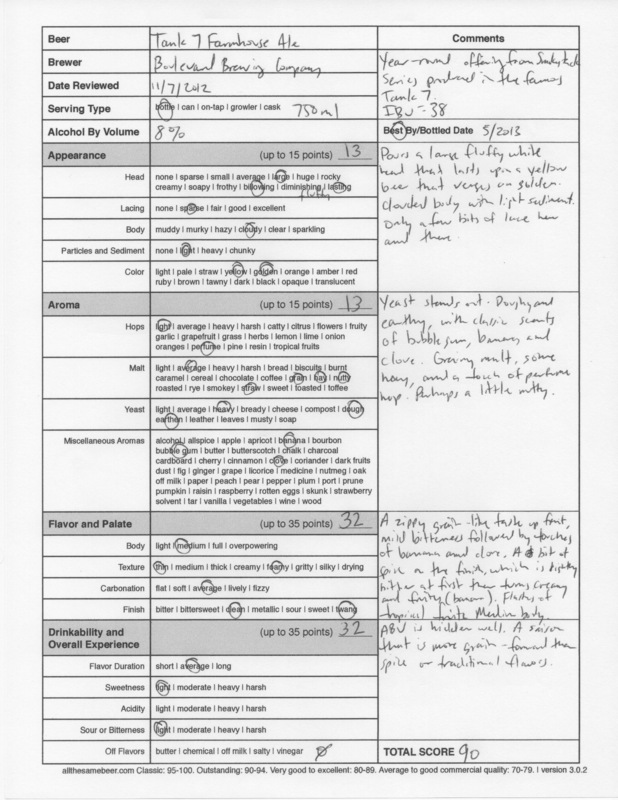 Those that get to work with fermenter number seven say it can be “a bit persnickety,” and have dubbed it the black sheep of the cellar family. 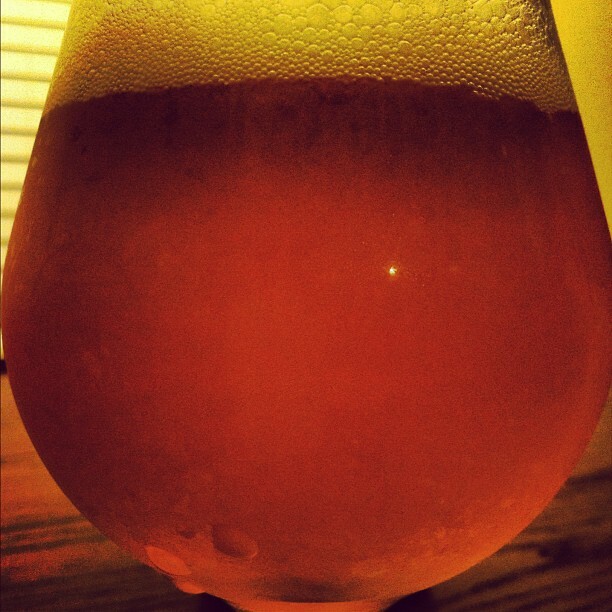 Tank 7 is brewed to 8% ABV (alcohol by volume) and uses Amarillo, Simcoe, and Tradition hops. The malts are corn flakes, malted wheat, Pale, and Wheat. And since this is a Farmhouse Ale, we all know the yeast plays a big part in this brew, but Boulevard are kind of quiet about their yeast. IBUs (International Bitterness Units) are at 38. This beer has year-round availability as part of the “Smokestack Series,” and comes in 750 ml corked and caged bottles, as well as four-packs of twelve ounce bottles. Pouring produced a large fluffy white head that lasted and sat atop a bright yellow beer, which verged upon golden when held to the light. The body was clouded as Tank 7 was filled with yeast sediment; toward the bottom of the bottle, the beer became even more cloudy as all the particles evenly mixed into the drink. There were only a few bits of lacing to report, and it was in minuscule, thin bits. On the aromatics, the yeast stood out, providing a doughy, earthen aroma, coupled with some classic Saison scents — banana, clove, and bubble gum. The malts were grainy, with whiffs of hay and a gentle nutty kick; the hops were very light with touches of citrus, especially lemon and orange. This really smelled like Boulevard’s Unfiltered Wheat beer with some spices and more hops added. Taking a taste, there were zippy grains up front, which gave way to a mild bitterness that brought on some of the banana and clove found in the nose. In the background, the citrus hops played out (lemon and orange, mixed equally) and a mild spice kicked in, along with another hit of bitter. The finish turned creamy and fairly fruity, mixing in equal hits of banana, orange, and lemon peel. With all of the yeast poured into the glass, the texture became much more creamy, turning from just foamy when swirled in the mouth to full on velvet. This beer was medium bodied, with a thin mouthfeel, and average carbonation. This is a Farmhouse Ale where the grain bill is much more up front than any spices or yeast flavors, and that is a refreshing change. The alcohol is also well hidden, as that is really the only thing that deviates this from a traditional Saison. 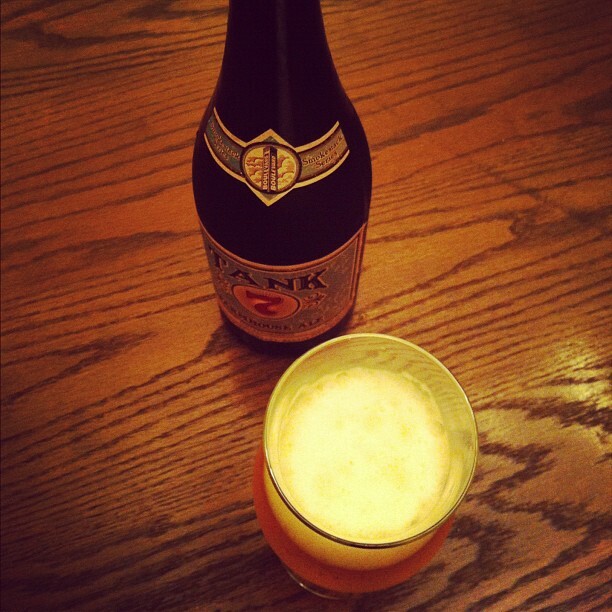 Tank 7 is a good beer and the big bottle format serves it well — I could see myself popping open another one of these and enjoying it over the spell of an evening any time. Flavorful and easy drinking, take this 750 ml to your next wine party. Boulevard Tank 7 Farmhouse Ale, 90 points. Price: $8.99 US for one 750 ml bottle.